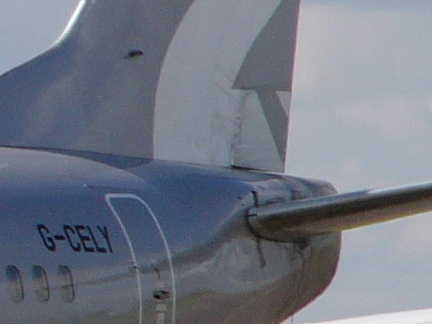 There are four vortex generators on each side of the rear fuselage above the horizontal stabiliser. 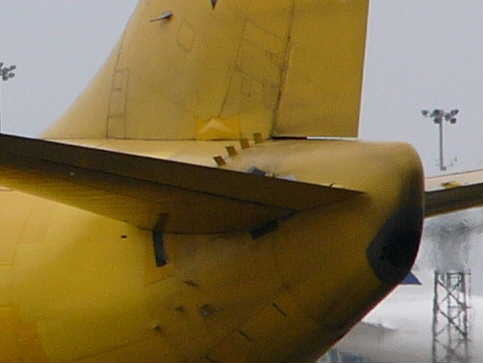 The 737-1/200s also had three vortex generators below each stabiliser. They were probably installed to energise the airflow at the stagnation point at the tailcone, thereby reducing drag and giving a slight performance advantage. Classics were initially produced without any aft body vortex generators (see photo. However the upper vortex generators were reinstated after line number 2277 (May 1992 onwards). This was to reduce elevator and elevator tab vibration during flight to increase their hinge bearing service life. The radome (RAdar DOME) is an aerodynamic faring that houses the weather radar and ILS localiser and glideslope antennas. Unlike the rest of the fuselage it is made of fibreglass to allow the RF signals through. Fibreglass is non-conductive which would allow the build up of P-static (static due to the motion of the aircraft through precipitation). 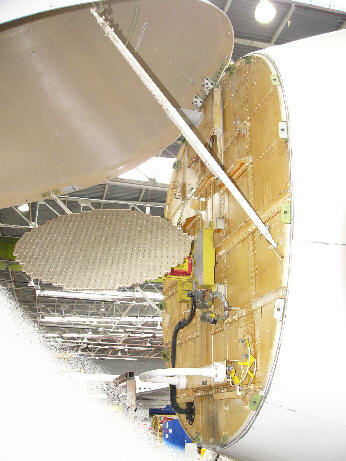 This would in turn cause static interference on the antenna within so the radome is fitted with six conductive diverter strips on the outside to dissipate P-static into the airframe. After the Aloha 737-200 accident, in which a 12ft x 8ft section of the upper fuselage tore away in flight, all 737's with over 50,000 cycles must have their lap joints reinforced with external doublers. 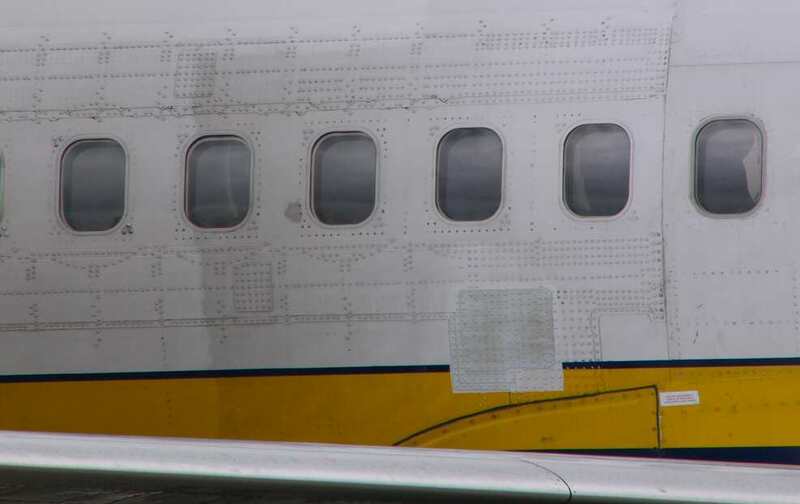 This tired old aircraft is a 737-200 and the patching is clearly visable. This modification takes about 15,000 man hours and unfortunately has sometimes been the source of another problem - scoring. This is when metal instruments instead of wooden ones have been used to scrape away excess sealant or old paint from the lap joints which create deep scratches which may themselves develop into cracks. SEATTLE -- KIRO Team 7 Investigators discover cracks, corrosion and weakened metal hidden inside a growing number of Boeing passenger jets. The problems lie along structural seams called lap joints. A fuselage is designed with overlapping sheets of metal riveted together. We uncovered at least 28 different warnings regarding flaws or defects. In 2002, a China Airlines jet plummeted into the water, killing 225 passengers. Fourteen years earlier, an Aloha Airlines 737 opened up like a sardine can, killing one person and injuring eight more. KIRO 7 Eyewitness News Investigative Reporter Chris Halsne discovers a big new problem for Boeing, centered on "lap-joint metal fatigue". The problem is called "scoring". During assembly, workers lay a bead of sealant along this lap joint. It makes the jet more aerodynamic. A year or two flying you around and many jets have to get repainted. Powerful chemical strippers melt the sealant, so some maintenance crews have been putting on caulk then, according to the Federal Aviation Administration, have been cutting away the excess with a box cutter. That can ruin the integrity of the metal along the entire aircraft lap joint. The FAA recently grounded three passenger jets due to "scribe marks" and has identified 32 more Boeing planes with damaging box cutter-type cuts along the lap joint. "When we found this, we jumped on it right away," said FAA spokesperson Mike Fergus. Fergus says they have no idea yet how many more jets are affected by scoring. "With the contraction and expansion of thousands of flight hours, the scratch has the potential, not a guarantee, the potential of turning into a crack. That in turn may have safety factor. That's our issue. If it's safety, we're interested," Fergus said. Scoring of some lap joints is just the latest chapter in Boeing's long battle with the design and maintenance of its riveted seams. "With that type of structure, whatever is occurring between the two sheets is not readily visible," said Earl Brown, a certified jet engine and airframe mechanic. Brown says the FAA has been warning airlines to inspect -- and re-inspect often -- the lap joints of thousands of still-operating older model Boeing jets. "If we can catch a problem when it's still just a crack and fix it, then we don't have to worry about something coming apart, breaking. The potential for breaking is there if a crack develops. It's pretty much inherent in the design of the airplane and the materials used," Brown said. The scoring issue has been kept quiet until now, but other huge maintenance nightmares include hundreds of previously "patched" or repaired planes. An Airworthiness Directive says new inspections are necessary to find "premature cracking of certain lap joints, which could result in rapid decompression." Spotting fatigue in the lap joints on the outside of an aircraft, through the paint, is nearly impossible. So here's what the airlines have to do: They have to bring the jet into a hanger and gut the interior. That can cost more than $1 million. The super-high cost of that "D-check" inspection is hardly an incentive for airlines to look really hard for trouble spots. For example, KIRO Team 7 Investigators uncovered an Aviation Safety Report filed by a mechanic last year. He reported his company ignored a potentially deadly safety problem saying, "A B737-200 had water leaking on passengers and inspectors found all fuselage lap joints leaking excessively." Despite that, the mechanic says the supervisor "told me to get off the ACFT and not to check any laps. This ACFT had to go." Independent aviation robotics engineer Henry Seemann doesn't look at a Boeing 737 like the rest of us. We view them as a whole. He sees them in tiny parts, up close, one rivet at a time. And what he sees should make all of us a little nervous: cascading metal cracks, loose shear clips, corroded lap joints and tiny cuts in the metal. Halsne: "Are there times when you walk up to a plane and think, 'I don't know about this one?'" Seemann: "Yes, I've had my moments of certain airplanes when I've looked at them and actually booked a different flight." Seemann invented a machine, currently used by Boeing itself, that automatically inspects lap joints. The robot could save the industry billions in early maintenance because it takes just a few days to computer map and analyze lap joint flaws. Current methods take a month. Despite the potential cost savings some airlines are telling Henry don't get that thing near our passenger jets. "There's a requirement that if you know something is wrong with your airplane, you're supposed to fix it. It's a moral thing," Seemann said. "Some are afraid of that -- that their fleet is kind of old and we're going to inspect their planes and we're going to put a big red "x" on them." The Federal Aviation Administration confirms this robot design is in the final stages of approval. It could revolutionize the way we spot catastrophic metal failures - before a serious accident. Boeing refused our repeated requests for an on-camera interview about "scoring" and other lap joint issues, but did provide us with some background on how it's working hard to fix the problems. We called Boeing again this week for a statement. While they still won't comment on past metal fatigue issues, they did say design improvements on their new line of 7E7's should take care of future problems. On the 3rd Feb 2005, 737-700, N201LV, L/N 1650, was the first ever 737 to fly without eyebrow windows (window numbers 4 & 5). They have been standard in Boeing aircraft back as far as WW2 bombers to give better crew visibility. Now they have been declared obsolete and removed from production. The design change reduces airplane weight by 20 pounds and eliminates approximately 300 hours of periodic inspections per airplane. Retrofit kits to cover eyebrow windows will be available mid-2006 for the in-service 737 fleet. Note the windows will still be available as a customer option and all military versions will continue to be delivered with eyebrow windows. Notice the 10 small vortex generators above the radome. These reduce the cockpit noise from the windshield by 3dB.